It should come as no confusion that the winged eyeliner and cat eye looks have become an essential key staple in the beauty and cosmetics world. When correctly applied, the cat eye and winged eyeliner looks are incredibly flattering to virtually every eye shape, and deliver a sultry, mysterious and glamorous look, even when the rest of your makeup remains understated. The ideal cat eye has been featured for many years in the beauty industry and is now considered to be a classic and timeless look. It was originally brought into popularity by a wide array of glamorous and famous 1960s silver screen actresses, including Marilyn Monroe, Audrey Hepburn, and Natalie Wood. Now, who doesn't want to capture the highly-coveted glamor of an old-Hollywood movie star into their makeup routine? 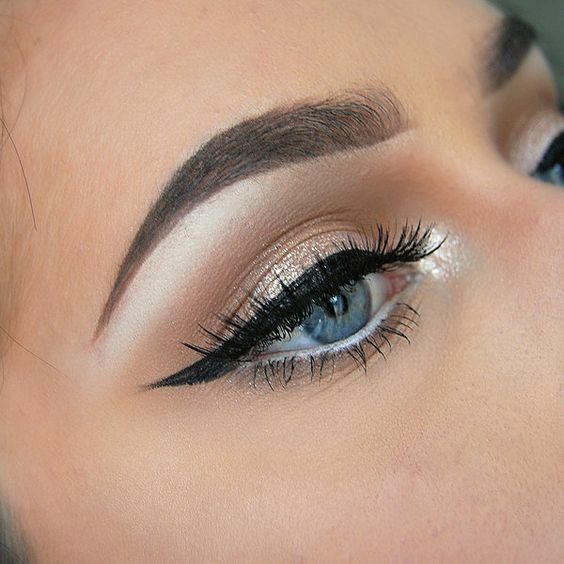 This is a beyond lust-worthy look! However, when it comes to recreating the perfect cat eye or winged eyeliner look, achieving the perfect results can be surprisingly difficult. Attempting to achieve this look without the proper guidance can lead to countless empty bottles of liquid eyeliner, cotton swabs, and eye makeup remover. Although, with right techniques, you will be able to recreate this classically beautiful look and implement it regularly into your beauty routine without a hassle. So for all of you vintage and retro girls living in the modern world, this your ultimate guide to achieving the perfectly flawless winged liner and cat eye looks! Here is a list of what you will need to begin. Primer, neutral eye shadow as your base color, light brown or beige eyeshadow, a good blending brush, as well as a high-quality flat liner brush, some kohl eyeliner or liquid eyeliner, liquid foundation, mascara and (optional) false eyelashes. Step 1: Start off by first lowering your eyelid. This will allow you to have a smooth surface on which to apply your cat eye. Follow by drawing an angled line from the outer corner of your eye. Step 2: Connect the top of your line down to your lash line to create a triangular shape. Step 3: Fill in the triangle with some liquid or black-colored kohl eyeliner. Step 4: Follow by connecting the triangular shape to the inner corner of your eye. Step 5: Dip a flat liner brush or Q-tip into some foundation to correct any mistakes you've made, while concealing in the process. Step 6: Finish off this look with several layers of your favorite mascara. Optional: Apply some false eyelashes with adhesive glue. Voila! Your flawless cat eye/winged eyeliner look is now complete! Here are some beneficial tips to ensure your winged eyeliner or cat eye look is beyond flawless! Tip 1: You can make your eye makeup last longer while simultaneously avoiding any potential smudging by setting your liner with a matching shade of eyeshadow. After you have finished lining your eyes with eyeliner, lightly dust on some black-colored eyeshadow (or a shade of eye shadow that matches the shade of eyeliner you're using) on top of your eyeliner to hold your liner in place, as well as to prevent the dreaded afternoon smudging. Tip 2: If you have difficulty lining your eyes with liquid eyeliner, use a kohl eyeliner or a pencil liner as a guide. Start off by first applying a pencil eyeliner, and then follow by tracing your liquid liner over the pencil liner. Tip 3: Add an additional pop of color and some extra brightness to a less pigmented shade of eye shadow by covering your eyelid with white eyeliner first. Not only will this help cancel out the color of your skin while simultaneously creating an even base for your eye shadow, it will also make your winged liner or cat eye look stand out more, because of the color contrast. Tip 4: You can transform your eye shadow into a personally customized eyeliner by using an either a wet flat liner brush or a Q-tip. The wet brush/Q-tip will richen the pigment of your eye shadow while creating a sharp eyeliner look. Tip 5: Use a white-colored eyeliner or white-colored eye shadow to create an instant eye lift. This will act as a highlighter to your eyes. Apply the white eyeliner or shadow to your brow bone, underneath your eyebrow. Voila! Instant Eyelift! 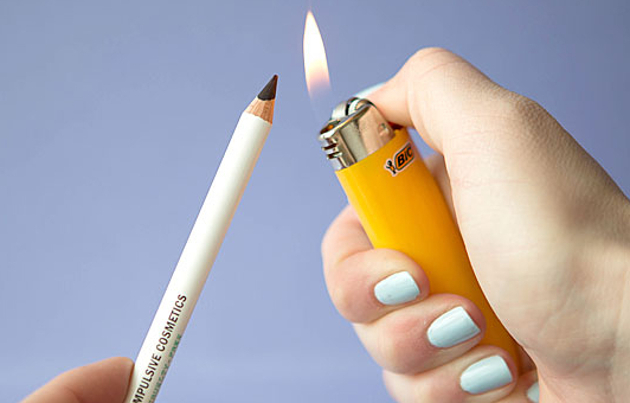 Tip 6: Transform your kohl or pencil eyeliner into a smooth and easy gliding gel eyeliner by warming the tip of your liner with a lighter. Tip 7: Perfect your cat eye or winged liner look by using the curves and edges of a medium-sized spoon. 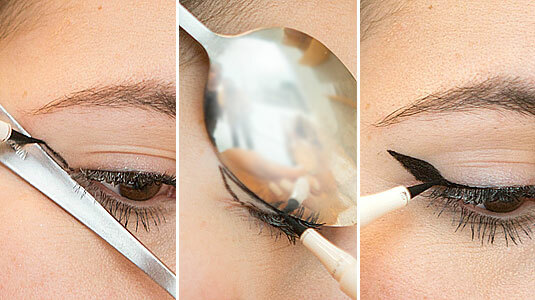 Begin by first using the handle of your spoon to trace the angled line, and then follow by using the curved section of your spoon to create your winged cat-eye shape. 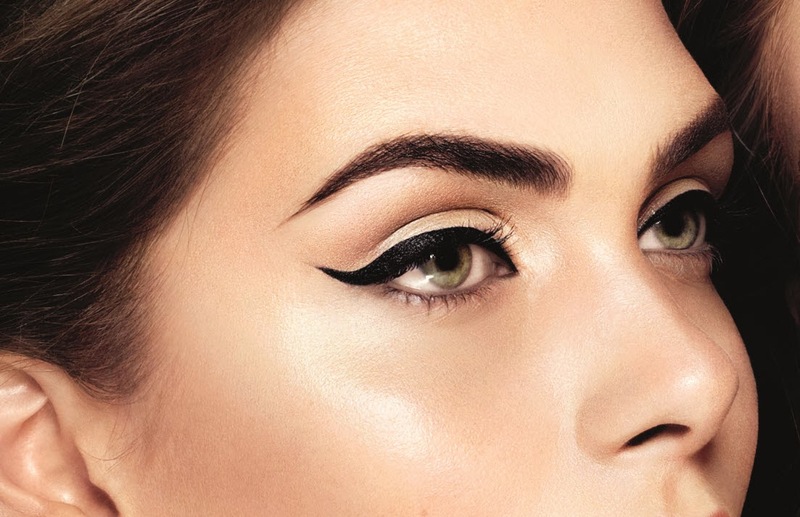 Follow by filling it in too quickly create the perfect winged cat-eye look. So there you have it! This step by step guide will allow you to master the perfect winged liner and cat eye look. It will also enable you to capture the glamor of old-Hollywood into your own beauty and makeup routine.